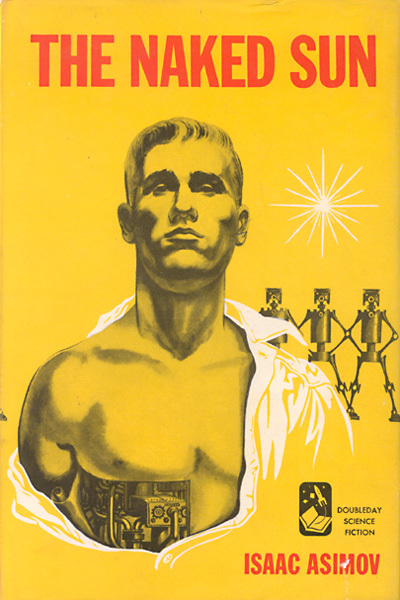 This is the second novel in Isaac Asimov's 'Robot' series of novels. 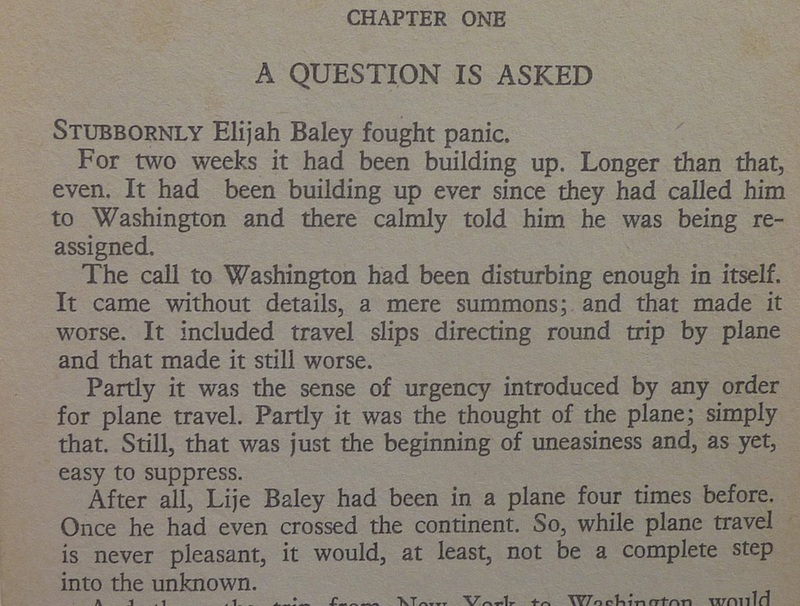 It again involves the Earthman 'Elijah Baley' and of course his companion, the Humaniform robot, 'Daneel'. 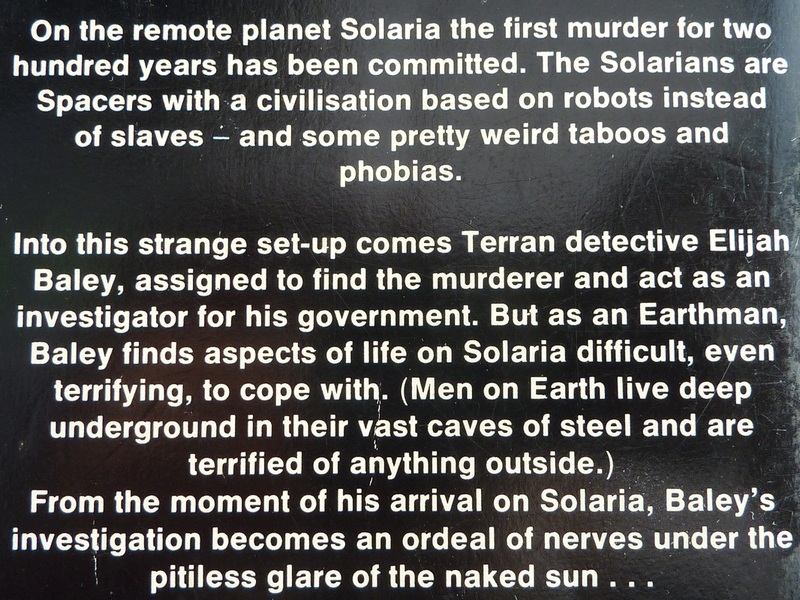 Whereas the first book in the series, 'The Caves of Steel', was resolutely set on Earth, this book moves the action to the Spacer world of Solaria. The 'Spacer worlds' within Asimov's fictional universe are the original 50 planets that were settled by Humanity's first wave of explorers. Those that left the mother Earth behind to find new worlds to populate. As time progressed, these 'Spacers' began to split apart from their Earth-bound heritage; both physically and mentally. Becoming blessed with very long life-spans and becoming more and more dependent upon robots, they began to view the Earth people as Humanity's second class citizens; disease ridden and short lived - cowering below the Earth's surface in their 'Caves of Steel' (the title of this book's predecessor). Because of this solitary lifestyle, Spacers avoid face to face contact (with a planetary population of just 20,000, distances are vast between inhabitants anyway). It is within this backdrop, that the Earth-man detective Elijah Baley is called to Solaria - the last of the fifty spacer worlds to be colonised. Each of the 20,000 or so inhabitants are tended to by thousands of robots, who perform all menial tasks and tend to the vast grounds that each resident lives within. Elijah's mission is once again to try and solve what seems a very puzzling murder case. 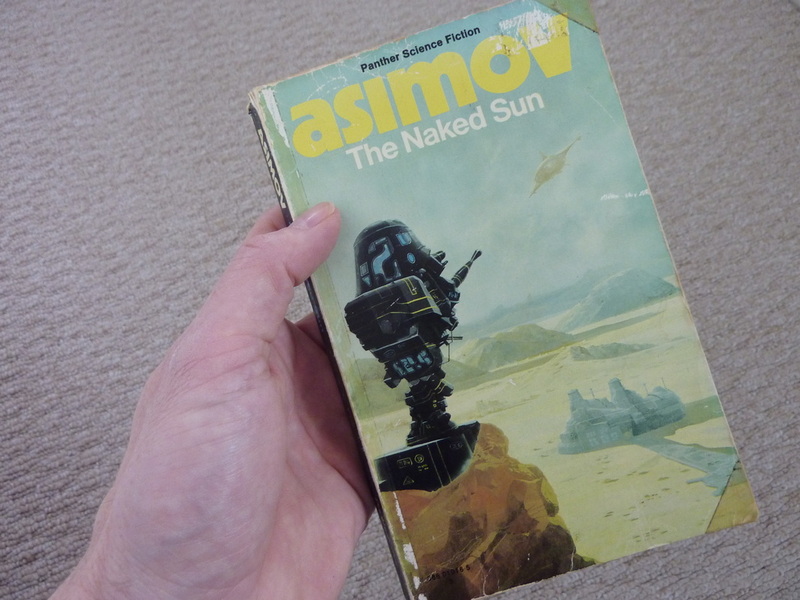 The Naked Sun introduces one of my very favourite Asimov characters. That is Gladia Delmarre. She is just brilliant and her character re-appears in both of the sequels to this book. ('The Robots of Dawn' and 'Robots and Empire'). As with most of Asimov's female characters, she is a strong, opinionated person; but of course this being written in the 1950's, she is also the damsel in distress in this story! Personally, I think this novel improves upon 'The Caves of Steel'. It feels more grown up to me and I think it is constructed better than its predecessor. I think that only 'The Robots of Dawn' and 'Rendezvous with Rama' rival this book! Having said that, the very ending of this novel is a bit of a let down...some would say it's a bit of a cheat. I perhaps quite wouldn't go that far, but it is slightly disappointing in that it's a tad unsatisfying. But don't let that put you off. This book is a masterwork! These two images on the right show the two artworks for this book that I am most familiar with. 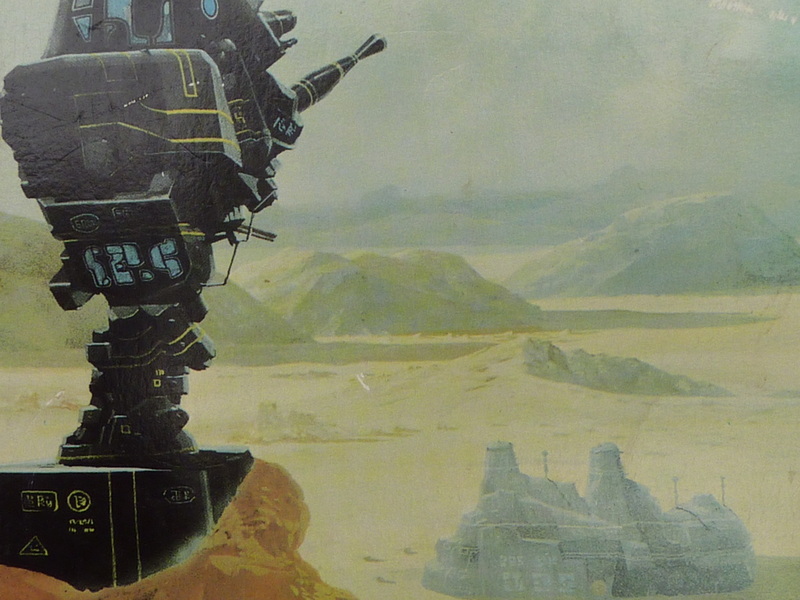 The first one is by an artist called Chris Foss and forms the cover of my paperback edition. Chris Foss produced the cover art for many of Asimov's books that were published around this time. I never really cared for them much myself, as they do not seem to bear much resemblance to the content of the stories. I mean, what is that giant clunky mechanical thing perched on the rocks? I just think it's a bit odd. Far better is the cover from the original 1950's edition (shown above right). At least it shows a decent representation of Daneel. At once showing his inner workings as a robot and his outer, human likeness. Image on the left shows the rear of my paperback edition. It provides a short synopsis of the novel.